APCO is proud to be able to reward pilots for their outstanding achievements on our gliders. We have already payed out more than $20,000 in prize money! Our latest $25,000 initiative is aimed at showing the paragliding world, that records can be set on standard production gliders. So that every APCO glider pilot knows, that they are flying with the best that is availalble to them. 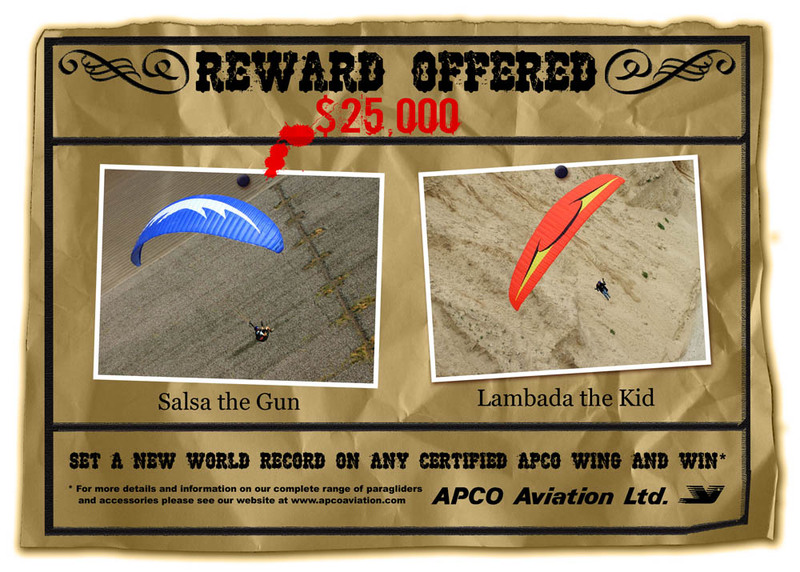 APCO announces a new intiative, sponsoring a campaign to conquer the Paragliding World Record - open distance or declared goal (free flight) - to be made on a standard APCO certified product from the current range. An unheard of prize of US $25,000 in cash, will be paid to the pilot breaking the world record. The record(s) must be FAI approved, fully documented and followed by a well written story and collection of nice, print quality photos featuring APCO products used for the new record. APCO will also handsomely reward a good story with attractive photos telling of the attempt to break World Record on an APCO current wing - even if it was unsuccessful and just ended up with remarkable flights -publishable in the media. For pilots needing to obtain an APCO wing to make an attempt to break the World Record - a special deal will be offered. All records must be officially FAI recognized. All other achievements must be officially ranked and published by the organizers. All flights must be made on APCO paragliders and the pilot must have concluded a signed contract with APCO. A List of competitions for pilot regestration should be submitted by the pilot to Apco for approval at the start of the season. Prizes will be paid either in cash or in goods. Absolute: This refers to general overall ranking, both male and female. eg. If the 1st female ranks 5th general/overall, the 1st female does not qualify for a prize. Countries in which 2 leagues exist - prizes will be awarded for Open Class only as listed. Local/Regional competitions, or National competitions in countries not listed will be awarded prizes on an individual basis on application and in accordance with APCO policy. The incentives and prizes are intended for free flying paragliding competitions and records. For incenties for all specialized competitions such as ACRO, Accuracy Landing, Paramotor etc. - Check with APCO.